The day before we spoke, Messmer was in the field studying sage grouse populations: “We’re looking at the sage grouse population and the space it occupies; where it’s being encroached on by conifers, development, etc.” Despite some encroachment, Messmer says there is still opportunity for habitat growth, and they’ve been tracking sage-grouse with GPS collars to help prioritize habitat management. These interstate differences could prove important in the U.S. Fish and Wildlife Service’s (FWS) decision, which is due in 2015, to list the sage-grouse as an endangered species. Sage-grouse occupy habitat in eleven western states, including Utah and Wyoming, and while the species’ health varies from state to state, an endangered species listing would apply to all eleven. It seems worrying, then, that the states are working individually to solve a problem that affects the whole. Messmer acknowledged that, at least in the eyes of FWS, there are discrepancies between the various states’ sage-grouse conservation plans, stating that FWS gave Utah’s plan a D and Wyoming’s an A. However, he maintains that that is an unfair characterization of the situation, because “each state has to plan for its own landscape.” Utah’s desert sagebrush landscape never supported the same sage-grouse population densities that occur in Wyoming, which excludes from conservation the habitat of approximately 40,000 sage-grouse. Comparatively, Utah has about 20,000 sage grouse in the entire state. Not only does a state have to mold its conservation plan to the habitat, says Messmer; “You have to fit the conservation plan with the culture and demographics.” In other words, people too are a part of the landscape. That is why Messmer and his colleagues have emphasized the importance of sage-grouse local working groups (LWGs), which are collaborative voluntary partnerships, which include private landowners, industry, and state and federal agencies, to facilitate species conservation. In the early 1990s there were 63 LWGs across the West, but that network has fallen apart in the past decade. Fortunately, there are still eleven LWGs active in Utah, and Messmer hopes to reenergize them in other western states. In Utah, the sharing of knowledge and experience in LWGs has proved invaluable to sage-grouse conservation. “When we started, we knew little about land use in the area,” said Messmer, and when “we talked with private landowners we learned that a lot of the concepts expressed in Connelly et al, 2000 were foreign to them.” Illustrating the need to incorporate local knowledge, the disconnect with the Connelly paper, which established guidelines for managing sage-grouse populations and their habitat, was in large part due to the fact that its research focused on managing sage-grouse habitat in Colorado, Idaho, Montana, Oregon, Washington and Wyoming, but not the desert sagebrush habitat of Utah. The best way to engage these private landowners in sage-grouse conservation efforts is through incentive-based conservation. 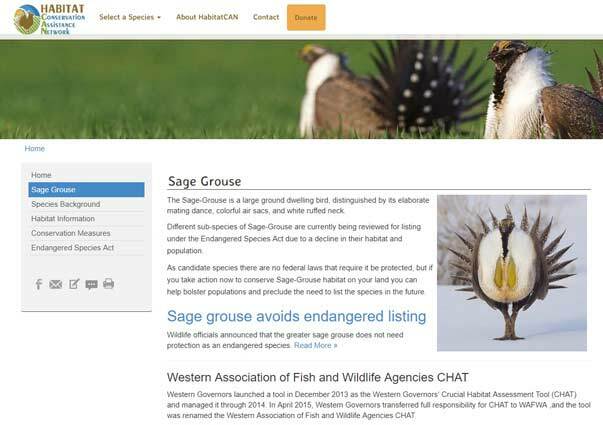 There are many state and federal programs, such as the Sage Grouse Initiative and Utah Environmental Quality Incentives Program, which provide landowners with technical and financial assistance for the improvement of sagebrush and sage-grouse habitat. However, while Messmer insists that incentive-based conservation is the best approach, but he says that there’s a problem with a lack of funding. The solution – expand the financial base from which they draw support. Borrowing a term learned during his military service, Messmer a few years ago wrote a paper entitled There are No Civilians: Species-at-Risk and Energy Development, which argued that American energy consumers should no longer be considered passive on-lookers in the energy development projects that destroy species habitat. Messmer gave me this anecdote: California was recently named the cleanest energy producing state in the country in part because of its extensive renewable energy projects, but that is a misleading title. There is a difference between energy production and energy consumption, and the other reason why California is the cleanest energy producer in the U.S. is because much of the energy Californians consume is provided by fossil fuels from neighboring states like Utah and Nevada. In fact, Utah exports more energy to California than is consumed in-state. So shouldn’t Californians take some responsibility for Utah’s energy developments? “They have to share in the conservation, not just the energy companies, but all who benefit from the energy need to be a part of it,” says Messmer. In our conversation, Messmer extended his There are No Civilians concept to hunting and outdoor recreation. American hunters have contributed billions of dollars to conservation since the passage in 1937 of the Federal Aid in Wildlife Restoration Act, better known as the Pittman-Robertson Act. The Act extended an eleven percent tax on firearms, ammunition and archery equipment used for hunting, and earmarked the proceeds to be distributed to the States for wildlife restoration. But what about other outdoor recreationists, such as hikers, mountain bikers and fisherman? Or winter sports enthusiasts like skiers and snowmobilers? The Pittman-Robertson Act is almost universally supported by hunting groups across the country; maybe the only tax people have ever been glad pay. Messmer thinks it’s about time for a similar tax on other equipment for outdoor recreation. Despite their ambitious work in Utah to conserve 80,000 acres per year, it’s a desert sagebrush region where 2-3 of every 5 years can be good and the other 2-3 can be plagued by drought, and sage-grouse fluctuate with the environmental conditions. Fortunately, sage-grouse are a relatively long-lived species, with a lifespan of up to 6 years, and hopefully 3-4 of those are brood years. But if this year and 2015 prove to be dry, down years, an endangered species listing could be influenced by a short-term decline in a population that may be moving towards long-term stability or growth. Something similar happened this year with the lesser prairie-chicken (LPC), another western grouse species, which was listed as a threatened species in March after a court mandated deadline. The listing was preceded by several years of drought, which resulted in a steep drop in LPC populations. Stay tuned, as over the next few weeks I will be speaking with some of the private landowners working with Messmer to sustainably manage sage-grouse populations in Utah. Yesterday, a group of 30 partners - landowners, conservation district folks, state and federal agency biologists, meet at the Dry Basin (DB) lek in west Box Elder county to discuss how best to protect the lek and surrounding nesting habitat from wild fires. The DB lek has the historic record for the number of males counted - exceeding 300. The numbers of males counted on this lek and others in the area have fluctuated in response to environmental conditions, but is now trending up ward. the partner reviewed the science about green stripping with forage kochia as a fire break. Although effective at halting wild fires spread, the partner were concerned about placing green strips through the lek. Recent research completed by Stephanie Graham, USU, indicated that sage-grouse eat forage kochia, based on availability, but it does not provide cover. Plus creating a new path or road through nesting habitat could increase predation rates. other were concerned about additional soil disturbance opening new avenues for cheatgrass. the group consensus was to "stay in the tree." Meaning remove the encroaching conifer and combining a fire break into this effort. The project would include monitoring to ensure any cheat grass invasion would be decisively addressed. This process demonstrates the strength and resolve of community-based conservation. The project will not only protect important sage-grouse habitat, but create more space to grow sage-grouse.